There’s a variety of freediving and spearfishing wetsuits out there, made from different materials, linings and colors. This article will provide an explanation about the different types of wetsuits and what to look for when selecting your freediving and spearfishing wetsuit. There are different types of freediving wetsuits, which we will discuss in detail further in this article, however all freediving wetsuits have one thing in common; All true freediving and spearfishing wetsuits are Open-Cell wetsuits or “Semi-Dry” wetsuits. They look very similar to the wetsuits used in SCUBA diving however they function in a completely different way. All wetsuits are made of neoprene, a form of foamed rubber material. Standard wetsuits, like the ones commonly used in the world of SCUBA diving are double lined, which means that they have a layer of fabric such as nylon covering the neoprene which the suit is made of on both of its sides (the side in contact with the diver’s body and the side in contact with the outside world). This type of wetsuit allows for a layer of water to come into the wetsuit and create a barrier between the diver’s body and the wetsuit itself. As long as the diver is constantly active during his dive, which is the case for SCUBA divers, and generates body heat, it heats up the layer of water inside the wetsuit and keeps the diver warm. While this type of wetsuit works great for SCUBA diving, it does not perform well for freedivers and spearfisherman who spend a large portion of their time on relaxation, breath up and preparation for their dive; They don’t generate as much body heat as SCUBA divers who are constantly active during their dive and will fail to heat up the water layer inside a standard wetsuit – resulting in feeling cold relatively quickly. The way to deal with the cold for freedivers and spearfisherman is using an Open-Cell or “Semi-Dry” wetsuit. An Open-Cell wetsuit is made of essentially the same neoprene material all wetsuits are made of, however instead of having a lining on the inside part of the wetsuit (the side which comes in contact with the divers skin), the top layer of the neoprene material is basically shaved off, resulting in a porous yet sealed surface also known as Open-Cell neoprene. When Open-Cell neoprene comes in contact with the diver’s skin, it literally sticks to it with a vacuum effect, effectively eliminating any water flow in or out of the wetsuit. The result is that instead of using a layer of water, which constantly needs to be heated up to insulate the diver from the surrounding environment, the neoprene material itself acts as an insulator and is far more effective in retaining any body heat which is generated by the diver. The heat retention effect of Open-Cell neoprene is so extreme that a good fitting 5mm open cell wetsuit will keep a diver warm for 40-50 minutes in ice water (0c temperature). The neoprene materials which are used for Open-Cell wetsuits are generally softer and allow a greater range of mobility in comparison with standard SCUBA wetsuits. 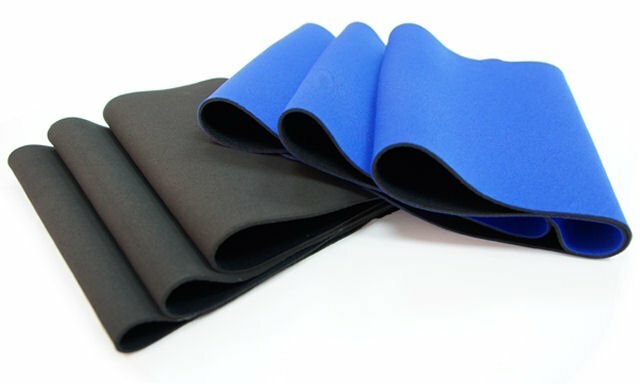 The most common neoprene materials used in freediving and spearfishing wetsuits are (from the most durable to the softest); Ecoline/Sheico, Nam-Liong, Heiwa, NJN, Yamamoto, Yamamoto-45. The different neoprene types vary by their level of softness (comfort) and durability, the softer a neoprene material is, the less durable and more prone to tear it is when coming in contact with objects such as reefs and rocks underwater. We have covered everything there is to know about the inside part of our freediving and spearfisihing wetsuit (Open-Cell) and now it is time to address the outside surface of our wetsuit. Freediving and spearfishing wetsuits are supplied either with or without an outside lining. 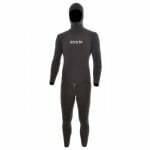 Lined wetsuits are wetsuits with an outside lining comprised of a material such as a highly durable nylon fabric covering the outside part of the wetsuit neoprene. While lined wetsuits create more drag underwater when compared to Smoothskin / Superskin wetsuits, they are much more durable to tear and other environmental damages thanks to the protective lining. Lined wetsuits are available in various camouflage patterns and are commonly used both by freedivers and spearfisherman. Wetsuits without an outside lining have no material covering the outwards facing part of the wetsuit neoprene. Instead the outside layer of neoprene is completely smooth. This kind of freediving and spearfishing wetsuit is called a “Smoothskin” or “Superskin” wetsuit. 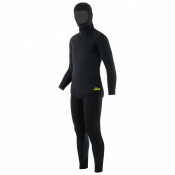 Smoothskin wetsuits have some advantages and disadvantages when compared to a lined wetsuit; They create far less drag underwater than lined wetsuits, allowing the diver to move more efficiently underwater, and they dry instantly as the diver exists the water, keeping him warm outside of the water even in cold temperatures. The main disadvantage to Smoothskin wetsuits is that without an outside lining to protect the wetsuit neoprene, they are much more susceptible to tear and environmental damage. 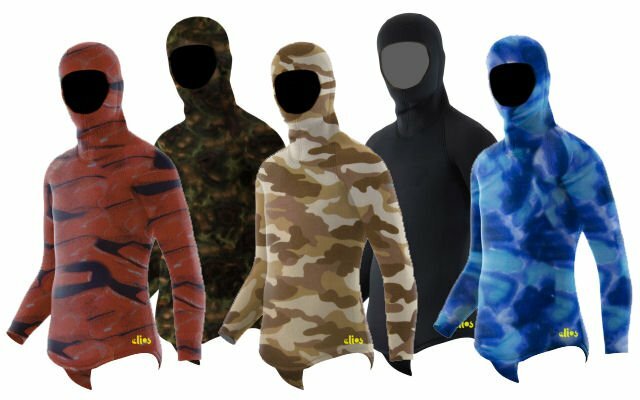 Smoothskin wetsuits are available in various camouflage patterns and are most commonly used in freediving competitions and by experienced spearfisherman and freedivers.